Excerpts from and links to all our info pages for Crimson Trace’s line of handgun laser sights. 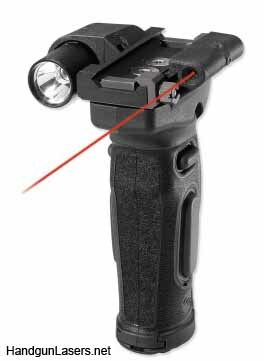 Looking to buy a rail-mount handgun laser sight for your pistol but not sure where to begin? I’ve combed through the 50-odd models on the market today and identified the two best. Both are top-rated with excellent reviews by consumers, are produced by well-known companies, and are available with red or green lasers. The author distilled 50-odd rail-mount handgun laser sights down to two. First I pulled together a list of all handgun laser sights, and then I ran a filter for rail-mount lasers to shed the grip-, slide- and frame-mount lasers. I then went through it and cut the laser-light combination devices, too (look for a best-of article on laser-light combos soon), and I deleted all the discontinued models, the lasers with archaic activation wires, the lasers designed to fit only one pistol, all infrared models, lasers with crummy looking or “sold separately” rail mounts, and one silly-looking “tri-beam” laser. Next I researched each remaining laser on Amazon.com (and to a lesser degree, OpticsPlanet.com and Walmart.com) to gauge how its doing with actual buyers and users. A couple years ago I examined 33 million Amazon product ratings and learned the average rating across all products is 3.95 stars. The margin-of-error behind each average rating falls to a reasonable level after roughly 100 votes, and the percentage of the dreaded 1-star vote averages around 8% (to read more about this study, check out my Amazon.com Star Rating Tips article). 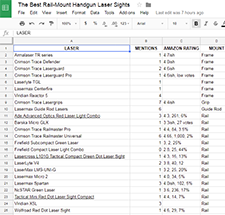 Finally, I performed a Google search for “the best handgun laser sights.” I clicked through 12 of the results and copied the names of all the laser sights listed by those other authors into one list to see which lasers were mentioned the most often. This entry was posted in Crimson Trace, Viridian and tagged Best Of Lists on October 13, 2017 by Jed Henson. This entry was posted in $251-$300, $301-$350, $351-$400, Crimson Trace, Frame, Glock, Green, Rail, Red, Smith & Wesson, Springfield Armory and tagged Laser-Light Combos on June 1, 2017 by Staff. This entry was posted in $201-$250, $251-$300, $301-$350, $351-$400, Crimson Trace, Green, Rail, Red and tagged Laser-Light Combos on January 31, 2014 by Staff. This entry was posted in $401-$450, $451-$500, $551-$600, $601-$650, Crimson Trace, Foregrip, Green, Infrared, Rail, Red and tagged Laser-Light Combos on December 5, 2013 by Staff. This entry was posted in $251-$300, $301-$350, $351-$400, 1911, Crimson Trace, Grip, Red on October 17, 2013 by Briley Kenney. This entry was posted in $301-$350, $351-$400, 1911, Crimson Trace, Grip, Red on October 17, 2013 by Briley Kenney. This entry was posted in $251-$300, $301-$350, Crimson Trace, Grip, Red, Smith & Wesson on October 17, 2013 by Briley Kenney. This entry was posted in $1-$50, $101-$150, Crimson Trace, Rail, Red, Springfield Armory on October 17, 2013 by Briley Kenney.